"The children often experience much stress and fear in association with the accident, and may feel that their life is in danger. This can cause posttraumatic stress disorder (anxiety disorder) in the long term, and this may constitute a major obstacle in their everyday lives," says Eva Olofsson. "My results suggest that the experience of having an accident has a greater effect that the actual physical injuries. To be injured as an unprotected pedestrian in an accident with a vehicle can be experienced are more stressful, more frightening and more threatening than, for example, a cycling accident with no-one else involved. We saw also that receiving care as an inpatient, with procedures that may be experienced as frightening in an unfamiliar environment, may produce more stress than receiving care at a clinic and being allowed home the same day." "We can see that a cycle helmet provides good protection against severe and life-threatening skull and brain injuries, in all types of cycling accident. Further, a helmet protects against facial injuries," says Eva Olofsson. 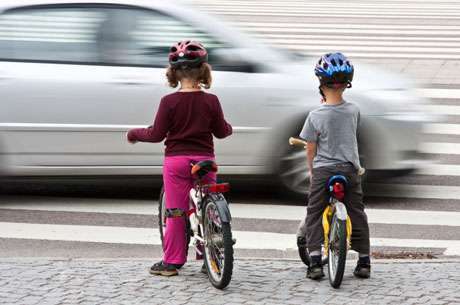 "Children are very vulnerable in traffic. It's important to determine what consequences a traffic injury may have for them, such that they can receive optimal care," says Eva.